Tired of your hallway being a dumping ground for discarded shoes? Get organised and reclaim ownership of your space with our hallway shoe storage ideas. From functional freestanding solutions like shoe racks and cabinets to all-in-one options suitable for the whole family, our storage selection may be your salvation. And if your hallway is too small for storage, read on to see our bedroom and dressing room shoe storage ideas. These will make the most of underbed space and the backs of doors, and can be used in any room where you need to squeeze in a little more storage for shoes. Doing more major work on your hallway? Our guide to designing a hallway is a great starting point. Short on hallway space? Consider a slimline shoe storage solution that maximises vertical space whilst maintaining order and easy access to shoes. We would recommend choosing a finish that matches your scheme, for a barely-there look. We love this Tromso shoe storage unit, which looks like a stylish console table when closed up and is the perfect spot for a hallway lamp or for placing your keys at the end of the day. Got a ton of shoes to stash? Despite its slimline style, each compartment in this shoe storage cabinet has double rows, allowing enough space for the whole family's footwear. Designed with space efficiency in mind, it only comes with front legs and can be positioned flush with a wall, making it the perfect addition to a narrow hallway. Find this Hemnes unit at Ikea. Ladder style units are an on-trend storage solution often found in bathrooms, living rooms and bedrooms – so why not bring them into the hallway too? Propped up against a wall, they make the most of vertical space whilst making a stylish addition to any hallway. Need a solution for the laziest of tidiers? Hinge-lidded baskets are a great alternative to more conventional shoe storage solutions - and give you a quick clean-up rate. They make a lovely feature in a hallway or can be easily stored beneath a console table. Hand crafted in Indonesia, we love the finish of this Kubu rattan box from The White Company. With growing families comes an ever-increasing number of shoes and a need for more storage. Whether you for-see this problem or not, stackable and extendable hallway shoe racks are a great solution and can be adapted to suit your changing needs. Find this clever storage solution at Lakeland. If you're blessed with a spacious hallway and don't want your shoes or shoe storage to be a feature within your hallway, opt for a more traditional storage solution. Whilst large shoe storage cabinets with tilted shelves are designed to maximise space, a more conventional cupboard would work equally effectively and make a stylish addition to a hallway. 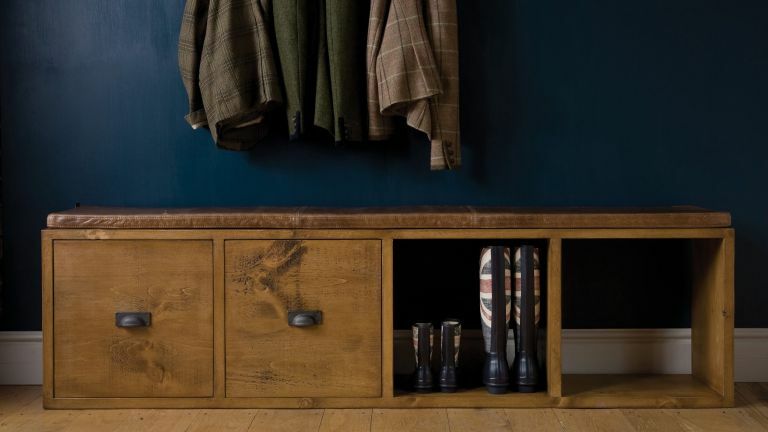 We love the country-feel of this Shoe Storage Cupboard from Wooden Furniture Store. Designed with welly wearers in mind, the Latchmere Welly Locker from Garden Trading has compartments with the height required for storage, in addition to four shoe compartments. If you'd like your shoe storage to serve more than one purpose, something worth considering if your hallway is short on space, opt for a more versatile unit. This Flour Plank Cubbyhole Storage Unit, available at Indigo Furniture, comes with three storage options: open, cupboard door or drawer. Each one is made from solid Quebec pine and an additional vintage leather seat pad can be bought. Sometimes it can be worth considering a storage solution that offers more than one option, particularly if you're short on space or want to hide your belongings away to create a more minimalist look. This Corinda Corrugated Metal Cabinet from Out There Interiors has several compartments; including handy shoe storage and a hanging rail for coats and umbrellas. Plus its industrial style is right on-trend. If you think you can keep your hallway neat and tidy (forever) then a open-storage solution could be for you. It's ideal if you have a modern scheme and provides ample space for shoe storage for all the family, in addition to room for bags, brollies and wellies. Find this Shoe Storage Cabinet at Symple Stuff. Opt for a nifty unit with a combination of storage solutions if you're looking to organise the whole family’s shoes, coats and bags. They're designed to keep everyday essentials on hand and ease the frantic feel of Monday mornings. This combination of a Pinnig coat rack with a shoe storage bench is a great starting point for a multi-functional storage unit. Find it all at Ikea. Multi-functional furniture is a great option if you're short on space, with this shoe storage bench providing the perfect perch for popping your shoes on in a hurry. Position by the door for ease and a spot to store everyday pairs of shoes. This Clockhouse hallway bench is available at Garden Trading. Tired of traipsing mud through the house after a walk with the dog? This boot rack is designed with wellies in mind. Pop dirty pairs upside down on the spokes and store by the back or front door for drying and easy access. Find this Metal Boot Rack at Cox & Cox. If you want to ensure that you're maximising hallway space, a built in floor-to-ceiling shelving unit certainly does the trick. Organise household bits and bobs in stylish wicker baskets, to ensure that daily essentials are on hand at all times. We love this Pembroke Shelving from Neptune. If your style is more industrial-inspired, this on-trend wire shelving is a great option for storing and displaying shoes. Want a little variety? Add interest with books, accessories and house plants displayed with little uniformity. Find these Mish-Mesh shelves at Loaf. Renowned for its sleek and stylish finish, Mid-century furniture is a great option if you're thinking about storage and can make a real design feature in a larger hallway. With three divided drawers, this Jensonshoe storage cabinet, available at Made.com, is a statement piece that's ideal for storing away shoes. Find a telephone bench and storage mirror as part of the same collection. A multifunctional piece of furniture, this modern storage table not only stores shoes, but could also be used as a console table for storing keys and other everyday essentials. Find the Wireworks Hello Storage Table at Lagoon. Stylish and practical, a bench with shoe storage is a great way to keep the clutter at bay. You're free to throw in boots and shoes, as well as bags, throws and other items without a home and no-one would be any wiser. A well chosen chest would make a great addition to a bedroom or living room, as well as making a great hallway shoe storage solution. Find this Rustic Wooden Bench Box at Cox & Cox. If you store your everyday shoes in your hallway, those that are used less often – such as dress shoes – are best kept in a bedroom or dressing room. Here are some great shoe storage ideas for bedrooms that make the most of untapped space. Or see more of our favourite bedroom storage ideas. Running out of cupboard space? There's often plenty of unused shoe storage potential to be found under the bed. Make the most of it and stay organised with the addition of a handy under-bed storage draw. We love the slimline Scandi-feel of this under-bed unit from Cuckooland. If you plan to store shoes in a box under the bed but are worried about damage, drawstring shoe storage bags are a great solution. Their fabric finish means that little space is lost, while shoes remain clean and protected. Consider adding a tag describing the pair inside the bag so that they're easy to find in a rush. Find this Dalmatian Spot Shoe Bag at The Contemporary Home. Lucky enough to have your own dressing room or walk-in wardrobe? This is the obvious place to store shoes, but how you go about it will make the difference between a cluttered floordrobe and the walk-in of Pinterest dreams. If you like being able to see your entire wardrobe at once (and trust yourself to keep it tidy) a customisable open-style storage unit could be for you. Build a unit that meets your needs, with space for storing heeled shoes, storage draws for everyday flats and boxes to stow away footwear that's out of season. We love the adaptability of the Algot Shoe Storage Unit from Ikea. If you don't have space for bulky furniture, consider a fabric storage unit. In addition to being affordable and keeping shoes ordered and out of sight, they're a great addition to a space with a slightly more rustic feel. Find this Shoerack Wardrobe at House of Bath. Often overlooked and unused, the back of a wardrobe door is a great spot for storing shoes with the addition of a handy shoe storage hanger. Got pockets left over? Fill them with umbrellas, scarves, gloves and other bits and bobs. Find the neatfreak! Twill over the door shoe organiser at John Lewis.